May 15, 2011, Abbotsford, B.C. The 2011 Canadian 17U Nationals saw our Durham Attack Girls earn Bronze! The three day event had our team play in Division 2 to finish off a very competitive season with great play. In 9 matches the team outscored the other teams 459 to 345 for a plus 1.33%. Only one match loss during the whole tournament by 23-25 and 25-27 prevented them from going for the gold. The girls played their hearts out and was probably the best VB they played all season. Every game, they were in control and composed. What a season, starting in September with tryouts and training. Two days a week court practices and another day a week of physical training prepared the girls to be in their best shape of their young lives. The team travelled to Kingston in November to win Gold. To Ottawa for an invitational. To Welland to earn Silver. Trenton for another Silver. St. Catherines in February. Chicago in February. Scarborough and then Trenton for another Gold. Waterloo for Provincials and finally, Abbotsford for Nationals and a Bronze. In between, Amazing Race night, Fire Hall experience and many personal team mates milestones such as birthdays, operations and drivers licenses! Thanks to the parents who helped organize the schedules, meals, scorekeeping, lines, video, hotels, car pools, travel and most of all support. Thanks to the girls for working hard, focusing on doing their best and being team players. Thanks to the coaches, who in the end had the responsibility of seeing that it all went all together! Ian and Curtis have volunteered their experience to the team for no reason other than for the love of volleyball and community involvement. Ian and Curtis have also done something that is the most important Gift of all in the Big Picture! They donated their Gift of time! In return our girls will grow to be young adults, and do things that they love to do, and will hopefully return the Gift to others. This year’s 17U Provincials turned out to be a weekend of surprises. We thought that the top four or five seeded teams were going to be the ones to watch, but it turned out that all of the top 16 were well trained and ready to play. Our girls were surely disappointed by not obtaining a top 3 finish, but it wasn’t for lack of hard work and effort. They showed up each day ready to play. Everyone contributed and each had their great moments. Day one ended with a team dinner and fun bowling night. Day two was their best day, winning all three matches in two sets. A photo op with Prime Minister Harper, who was there to watch his son play, just topped the day off. Rayan, Abbey, Nicole V., Hayli, Nicole S., Becky, Olivia, Shannon, Brooke, Chantal, Ashleigh and families, would like to thank Ian and Curtis for volunteering their time and energy to the team for the 2010/2011 season. The coach’s dedication to the team and girls is much appreciated. The training, focus and experiences that were taught and learned will go far beyond the volleyball court. The girls look forward to going to the Nationals in British Columbia. 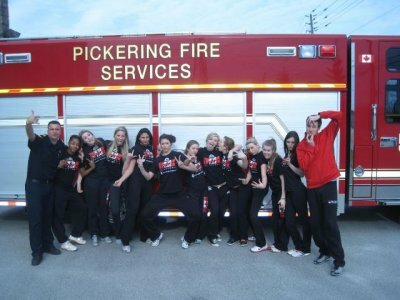 Thanks to Ian, DA Girls 17U Black had an opportunity to see how part of the Pickering Fire Service works and had a chance to wear the protective clothing and equipment. The task was to locate a dog (toy) that needed help in a smoke filled house. They wore protective pants and jackets, 20 lb. oxygen tanks and blacked out masks for the simulation. The girls had to rely on team work to find the dog that had been hidden in the fire hall. Crawled up and down stairs and down halls on their hands and knees, blinded and breathing the oxygen. One partner felt the wall the entire time and the other sprawled out to search for the dog, while staying attached to partner. All of them found the dog with the help of their partners. They had a chance to see a little bit of what our firefighters have to deal with in real life. The lesson for them was communication and trust. Team building is important for the girls and this fun exercise proved to show them communication, trust and cooperation will help them achieve their goals. DA Girls 17U Black – GOLD! The final tournament of the regular season for DA 17U Girls Black saw them earn Gold at the 18U Bugarski Cup. A trip to Chicago meant that the team missed the last 18U tournament which relegated them to the Trillium Division. The girls were relaxed and ready to play this weekend. They talked it up, communicated on the court and kept their composure when it counted. Serves, passing, setting and kills were all executed well. Two set match wins against Select 94 and Etobicoke 381 gave them 1st place in their pool. Outstanding blocking helped to setup another 2 set win against Diamonds that sent the girls into the semi-finals. A competitive match with the Grizzles, a friendly team of players and some former teammates, saw DA earn a 3 set win. 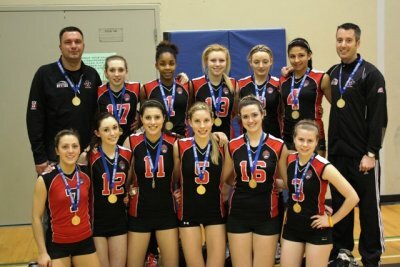 The Gold Medal match was another competitive 2 set win over Pegasus 17U of Kingston. The second Gold for the team along with two other Silvers was the final count for the regular season. They now look forward to the 17U Provincials and Nationals. Congratulations to coaches Ian and Curtis for all your hard work and dedication for and to the team and to the Ladies, great job! The team had a short drive to UTSC to play in the 17U Premier division, but they had a long day on the court. Once again this division proved to be very competitive with the top teams taking turns in wins and final standings. Our girls started the tournament as the #2 seed and finished #5. Other teams moved up and others down as well. A come from behind win for Defensa was the first game of the day for DA. 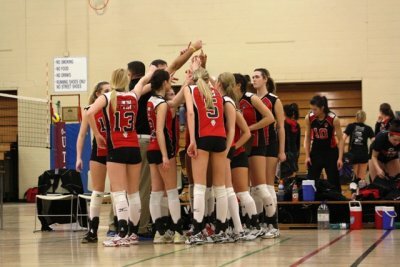 Other games included wins over DRVC and Burlington Blaze and saw Aurora Storm and Interclub win in tie breakers. The girls played hard with strong setting and kills. With the exception of giving up strings of points in the middle parts of the sets, they could have easily been in the finals. Provincials in April are the next 17U tournament for the team, the final test for the 17U Ontario Teams before Nationals. Keep up the hard work! Ladies and Coaches. DA 17U Girls travelled to Chicago Land this weekend to play in the 2011 Presidents Cup. What a great time and experience the girls had playing against the top teams in the Mid West USA. Our girls played some of their best volleyball of the year so far. They communicated, passed, set, killed and played hard while having fun the whole weekend. The afternoon wave gave the team time to shop and bond during the mornings. Although they finished some of the games around 10:45pm, they were ready to play the next day. As expected, the American teams were tall, fast and strong. Our girls played just as hard with 5 out of their 8 matches going to a tie breaker and finishing with 3 match wins and a .99% points for/against average. Each match could have gone either way. Every player on the team had their outstanding moments during the weekend of play. Everyone one had a great string of serves, passes, kills or timely saves. Rayan, Abbey, Nicole V, Hayli, Nicole S., Becky, Rianna, Olivia, Shannon, Brooke, Chantal and Ashleigh, all did a great job and represented Durham Attack, the OVA and Canada proudly. Thanks to Coaches Ian and Curtis for all your hard work and dedication to the team. Anyone who follows the 17U Premier Division knew that today’s 17U Girls Challenge Cup was going to be the most competitive tournament of the season so far, and they weren’t wrong. As we said before, any of the top 4 or 5 teams can win on any given day. With 3 of the top 16U teams qualifying along with the other 9 top 17U teams, it was going to be a battle. Defensa won the first match against our DA 17U Black team, which was the start of the battle for our girls. Our girls fought through injuries to earn a 3 set match against Ottawa Mavericks to finish second in their pool. Another 3 set match against Georgetown Impact for the crossover was as close as could be. The first set was 23-25, the second 25-22 and the tie breaker 15-12 for our girls advanced them to the quarter finals. KW Predators were next. DA won the first set 25-17. Predators came back to win the second set for a 14-25 win. The tie beaker was again tight 7-7, 7-8, 8-8, 9-9 until the Preds finally won 11-15. The final match of the day was against DRVC. Once again and for the fourth time today a match went to a tie breaker for DA. Our girls won the first set 25- 21, DRVC won the second 23-25. DA 17U won the tie breaker 15-10. Four of the days five matches went to tie breakers for DA. The tournament proved to be a battle, DRVC won over Storm, Storm won over STVC, DA won over DRVC, Predators won over DA etc. As we said, any team on any given day. The next tournament takes the team to Chicago. Keep up the hard work, coaches and team.